ProviNET has figured out how to make IT work for your business with our not complicated, all encompassing managed service offering. These hassle-free plans are designed to make sure that your IT operations run smoothly. You choose the service plan that best fits your infrastructure. We will manage your technology, so you can focus on the other important areas of your company. 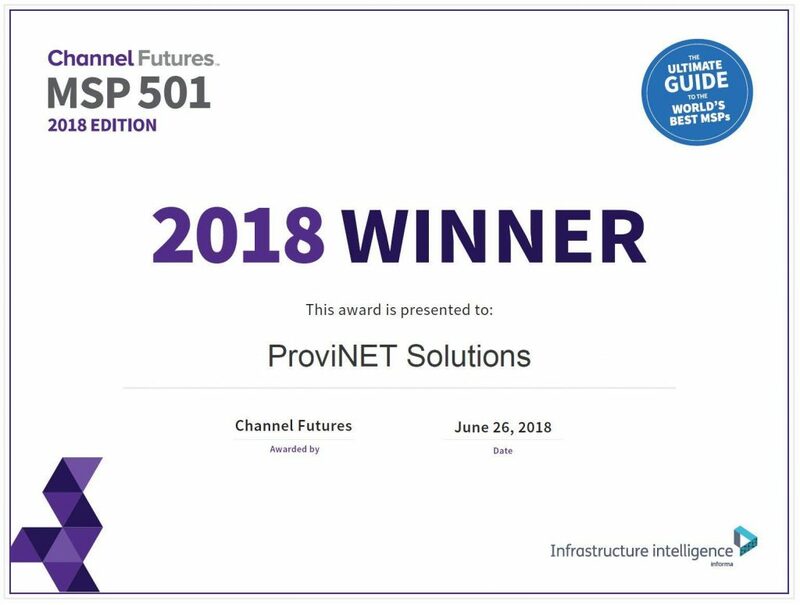 ProviNET Solutions ranks among the world’s 501 most strategic and innovative managed service providers (MSPs), according to Channel Futures 11th-annual MSP 501 Worldwide Company Rankings. Technology, it’s perpetually changing the way that we live, work, communicate, and do business. At ProviNET we know technology, and we know it can improve your business. We understand that you need technology to work so you can focus on what matters. Our managed IT services provide proactive services to take care of issues before they impact you. It’s time to get back to what matters. Let ProviNET be your IT department. Jackie Pletsch, Office Manager at Joseph A. Schudt & Associates, discusses why they have been using ProviNET’s Small Business services for nearly a decade. Is your Small Business struggling with technology? ProviNET has simple, affordable Managed IT Solutions to proactively keep your business running smoothly. Our hassle-free plans are designed to help maintain your infrastructure. We will manage your technology, so you can focus on the other important areas of your company.